Welcome to the Treehouse, overlooking majestic Lake Tahoe! Whether you're escaping on a romantic getaway or a friends' gathering, the view from this updated cabin will have you coming back year after year. Arriving at the Treehouse, you'll be welcomed by a beautiful deck where you can enjoy your morning coffee or watch the sunset colors reflected in the waters below. Stepping inside, you'll find an open concept living area with kitchen, dining, and full bathroom on the same floor. Broad windows bring the view inside while relaxing on the sofa and from the dining room table. 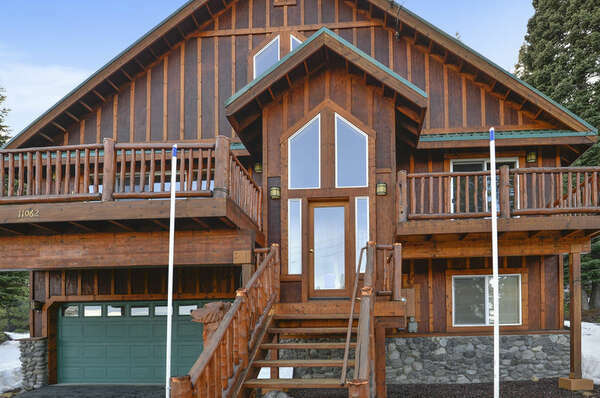 This cozy cabin is set up for your enjoyment and with your Tahoe experience in mind. More views from the bedroom, along with a reading nook, are found on the second floor. Private but with space to spread out, you'll create long-lasting memories amidst the forest, the mountains, and the Lake of the Sky. Please note, this home is best suited to accommodate a couple or single occupant. With that said, the home does offer a second bedroom with two smaller sized pull out chairs that can be pushed together into a full size bed. These sleeping accommodations will suit a young child best as it is not a true bed. Please keep this in mind when selecting your next vacation rental. Located above Kings Beach, our charming Treehouse will become your year-round vacation home base. See our page about North Lake Tahoe Things To Do for suggestions of activities during any season. Bring your beach toys if visiting in the summer - the Treehouse is a short 5-minute drive (or 20-minute walk!) to Kings Beach State Recreation Area. Golfers will find the Brockway Golf Course within a few minutes’ drive. There are plenty of hiking and mountain biking trails nearby, including the Tahoe Rim Trail and access to the old Stateline Fire Lookout with panoramic views over the entire lake. Winter brings on a whole new range of activities, with North Lake Tahoe Skiing and Snowboarding just a short drive away. The Treehouse is within walking distance of the Cal-Neva and Crystal Bay Casinos, along with local shops and restaurants - there is no shortage of activities to fill your days and nights with any level of entertainment, adventure, or relaxation that you might seek.